ssmnky doesn't have any items in their booth! Super seller and great service. This was my first time buying and let me tell you this seller is excellent communicating to you. I very much highly and proudly recommend this seller. You will not be disappointed! Sweetheart of a seller, polite and professional. Highly recommended. I have bought from this great seller quite a few times and let me tell you, she goes out of her way to ensure your satisfaction as a buyer.I very much highly and proudly recommend this seller. You will not be disappointed! Very happy to be the first one to recommend this fabulous seller. 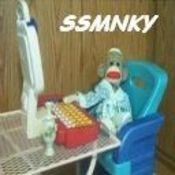 Iâ€™ve purchased from ssmnky several times and always had a fantastic transaction. She is an excellent seller and her products are terrific. You will love it here!